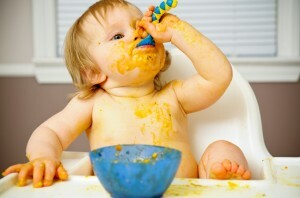 Baby-led weaning is the trendy way to introduce your baby to solids. To summarize, baby-led weaning is basically skipping purees and letting your baby feed herself with finger foods. Your baby eats with you during family meal times–and often even family foods–right from the start around six months of age. 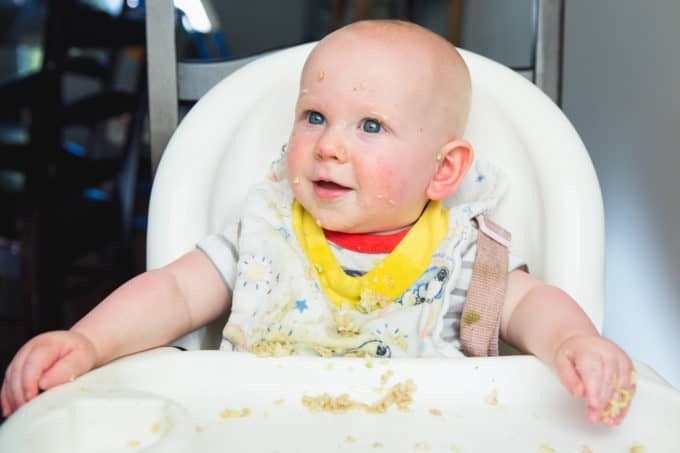 You might be wondering why is baby-led weaning such a popular way to introduce babies to solid foods. 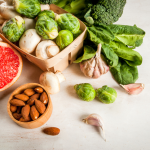 unprocessed “real” foods are potentially very nutritious. Yet I hear from many moms who want to try baby-led weaning, but are too terrified that their baby will choke on solid foods. 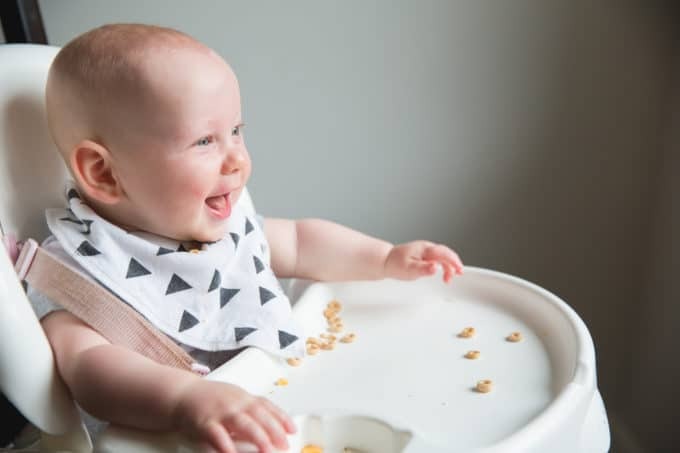 Some good news recently came from a new study of 206 babies, called “A Baby-led Approach to Eating Solids & Risk of Choking.” The study compared a group of baby-led weaners (whose parents were given extra education on how to safely practice baby-led Weaning) to a “control” group. The control group babies mostly started solids using the standard puree method. While the baby-led weaners did gag more at six months than spoon-fed babies, they gagged less by eight months of age. Because by this time, the baby-led weaners had gotten used to eating solids, and the pureed feeders were just starting! And there was no difference in the number of actual choking episodes reported between the two groups. Speaking of gagging – one common misconception is that gagging is the same thing as choking. Gagging is extremely common when babies are starting solids. In fact, gagging is a safety mechanism to prevent choking. Gagging doesn’t usually bother babies; but it does often bother parents! The gag reflex effectively keeps larger food pieces near the front of the mouth, only allowing very well-chewed foods to the back to be swallowed. A potential benefit of introducing real foods sooner, is that the gag reflex is further forward in your baby’s mouth. This reflex moves farther back on your baby’s tongue as he ages. So don’t freak out and scare your baby if he’s making gagging noises! She can bring the food back up to the front of her mouth to chew, and move along with her meal! Let your baby feed himself. 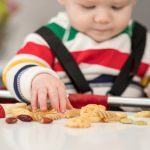 If you put food into their mouth, it may immediately fall to the back of your baby’s throat, without having a chance to control it with their tongue and chew it. In the study quoted above, a total of three out of 206 babies choked to the degree they required emergency health care assistance. Of these three babies, two choked on milk and the third choked when food was placed in its mouth. Never put a piece of food into your baby’s mouth. Watch your baby while he eats. While you can hear your baby gagging, you can’t hear her choking. Choking is often silent, which is why it’s so important that you sit down and eat with your baby. Don’t continue preparing food or do the dishes. Use a proper high chair. And unless there’s a risk of your baby falling or climbing out, I preferred not to buckle the high chair with my babies. That way you can get them out quickly, if needed. Make sure baby is sitting upright, and not in a reclining position. Don’t offer food in choking-hazard size. Your baby’s air pipe is about the width of one of their finger nails, so it’s important to serve thinly sliced foods. Avoid round items like whole grapes, cherries, nuts, berries, cherry tomatoes and wieners. Instead, slice them in halves or quarters. For harder fruits and veggies, I like to cut them in the shape of a potato chips: long enough for a beginner to grasp, but thin so that choking isn’t likely. Offer soft foods. Steam fruits and veggies and test the foods to make sure you can mash them with your tongue on the roof of your mouth. It’s much easier to cough up a piece of soft food, than hard food. Don’t let your baby play with toys or watch TV during meals. They need to focus on learning this new skill or eating. And a distracted baby is more likely to choke. Take an infant CPR class. This way, you are confident in dealing with choking if it does happen. Extra Tip: The #1 most common food that Baby-led Weaners choke on is full apples. I suggest serving apples peeled, sliced thinly and steamed for beginners. Once your baby is older, you can use a cheese grater to grate hard foods like apples. 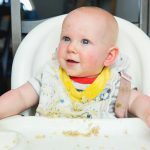 I hope that these tips to prevent choking help you feel more confident in using Babyled Weaning! If you want to know more, join my free Baby-led Weaning Facebook group (www.blwcommunity.com) or grab my new book in stores or online: The Parents’ Guide to Baby-led Weaning. Jennifer House is a Registered Dietitian, mom of three and owner of First Step Nutrition in Calgary, Alberta. Jennifer works with moms to help them nourish their growing families with confidence! 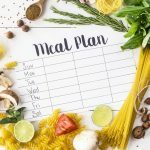 Whether it’s dealing with mealtime struggles, starting Babyled Weaning or getting organized with meal planning, Jen helps her clients decrease food overwhelm through online and in-person programs. Thank you for sharing this! This was my biggest concern starting this process with my baby. Such great info! 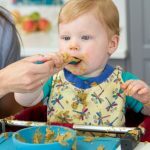 Great tips on baby led weaning and keeping baby from choking! 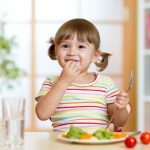 I will definitely refer clients looking for child nutrition tips here! Great info! Great tips thanxs for sharing. Thanks! Thoughts on how to safely eat bananas? Our baby grabs it and wants to shove the entire banana in her mouth and it ends up breaking off an inch long piece. This doesn’t seem safe. I totally understand how nerve wracking this can be. Make sure that the banana is ripe (not green) and always sit with her when she eats. Recognize the difference between choking and gagging and she will be fine. If you’re nervous try cutting the banana length wise. That way she can still pick it up and feed herself, but she will get less in her mouth with each bite. You may want to re-read the study you are citing on this page where you say there is no difference between the intervention and control groups for choking risk. The BLISS trial used a modified version of BLW and compared to those infants fed by current nutrition guidelines. 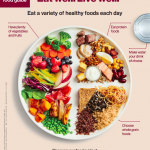 We can’t say that there is no difference in BLW as originally designed compared to infants not being fed by this approach.
. She is a fellow mom and will be a fantastic resource moving forward. You’re doing a great job – contacting a Registered Dietitian is step one. Let’s get you started!